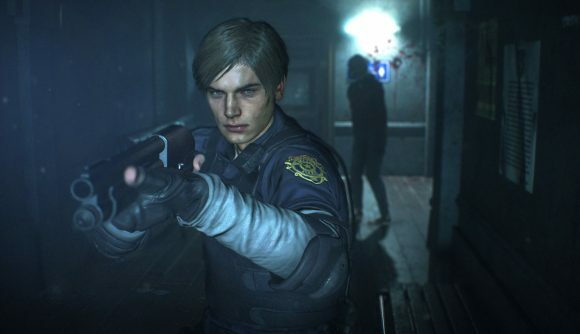 Beyond the updated graphics, one of the biggest changes introduced in the recent Resident Evil 2 remake was the removal of fixed camera angles. While the original games let you explore environments from a pre-determined viewpoint, the recent remake abandoned that approach in favour of a more modern, third-person set-up. But nostalgia is a powerful force, so one modder is doing their best to recreate the game’s original look. Modder Enveloping Sounds posted two videos to YouTube last week documenting the progress they’ve made on the mod, which uses a simple camera tool to adjust the viewpoint, creating a new scene whenever Leon or Claire reaches a new part of the world. The first video shows off Leon’s intro, culminating in his dramatic meeting with Claire. The next video takes on the second character’s playthrough, offering a new perspective on the orphanage that she explores later on in the game, in what proves to be a slightly more effective realisation of the initial concept. You can check out Leon’s video here, and Claire’s further down this article. At the moment, this is far more proof of concept than a finished project. That helps explain some of the more janky transitions in Leon’s playthrough (although Claire’s is much better), but sadly also means it’s not possible to download the mod for yourself just yet. Other Resident Evil modders aren’t taking things quite as seriously as Enveloping Sounds, as one player just decided to mess with the game’s facial animations, making Leon scarier than some of the monsters he encounters. The return to Raccoon City has proved pretty popular so far – Chris’ Resident Evil 2 PC review is gory but glowing. Its success has been mirrored in its sales, too, as Resident Evil 2 has already sold more than three million copies. Those figures helped make it one of Capcom’s biggest-ever Steam releases, behind only the juggernaut of Monster Hunter: World.